Baby shower cake with shoes made of gum paste. 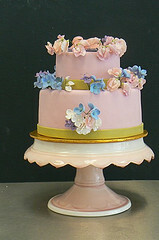 For the following cake you will need 3 – 9″ cake pans prepared with pan spray and lined with rounds of parchment paper. Preheat oven to 350 degrees F.
After the butter, oil, sugar and vanilla are well creamed and you have added the eggs to that mixture one at a time, scrape the bowl well and beat with the paddle until there are no lumps of butter remaining. Alternate the flour with the coffee/cocoa mixture in thirds scraping often to make sure there are no lumps of flour or butter remaining. Do not overmix. Pour even amounts of batter in each pan. Bake for about 25 minutes or until a toothpick poked into the cake comes out clean. Cool in pans for at least 15 minutes before depanning. Cool the cakes before chilling them well in the refrigerator. Place the frozen blackberries into a saucepan and stir in the granulated sugar. Allow to sit until the juices from the berries starts to emerge. Over a medium heat, start to cook the berries gently. Bring to a boil and strain immediately. Cool in a large shallow bowl to a temperature of 110 degrees F.
Bloom the powdered gelatin in the cold water and melt in the microwave or in a saucepan of hot water to at temperature of 110 degrees F and then stir in the blackberry mixture well. Refrigerate until the temperature decreases to about 87 degrees F.
Make a simple syrup by boiling 1 cup of granulated sugar in 2 cups of water for 10 minutes. Cool and add 1/2 cup of Chambord, blackberry liquor..if you wish to add more Chambord adjust the taste to your preference. Build your cake in the usual manner by lining a 3 inch high cake pan with plastic wrap. Trim a layer of cake flat and brush the cake with Chambord syrup. Pipe a dam of Italian meringue buttercream and fill with blackberry mousse. You can double the line of the dam to achieve a thicker filling. Repeat and end with the top layer of cake turned upside down so that the cake is nice and flat. Chill for at least 8 hours to set the filling. Open the plastic wrap and place a cake board on top of the cake, flip out and flip the cake back onto a cake board so that the syrup continues to move down the cake..this is important…because if you allow the cake to remain upside down on your cake board the syrup will move out of the cake and soak your cake board…not a good thing..always remember that when you syrup a cake to place the cake on the cake board so that the syrup is moving down. Ice the cake and decorate as you wish.